With a slightly richer color than Imperial, Pilsen is also drier and has perhaps a hint more hops. It thus ranks as a superior beer to its yellow-labeled brother, but not by much. And superior is such a strong word for a beer that barely manages to register as a pilsner. In fact, it's a rotten insult to the style, but in a difficult beer-land like Costa Rica, one must cope with what's available. 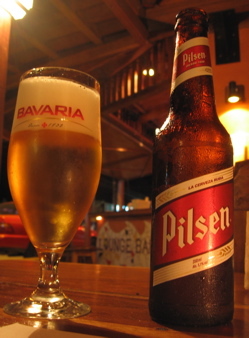 In a cold glass, Pilsen holds a nice, thick head just like Bavaria Dark, and it keeps up a pretty good effervescence. It also manages to pair pretty well with spicy foods. In the photo you're seeing its fancy new label, which just debuted in the past couple of weeks. The heat and humidity here make the beer drinkable, and its dryness makes it far more thirst-quenching than Imperial, which can be cloying and obnoxious as the last few sips in the bottom of the bottle warm up. At 5.1% ABV it packs a heftier punch, too. If we had half-stars, I would rate it half a star over Imperial, but on a five-star scale, it's still just a two-star beer. This page contains a single entry by Erik Arneson published on September 24, 2010 11:16 AM. ExOfficio Travel Underwear was the previous entry in this blog. Travel Skills: Wireless Internet Access is the next entry in this blog.